Dave Brown Vibra-Damp Mount rubber isolator rotted away after a very short time. is there an alternative to the rubber replacement ones . they seem to be of poor quality. not sure I would even fly with this mount with a ys 120. As MTK suggests, McMaster has material that will work. 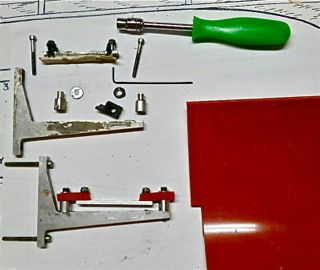 I've used their polyurethane sheet material to make replacement blocks for the DB mounts. Don't recall the durometer hardness, probably 80A. They offer a sample pack of 6 different hardness sheets you may wish to obtain for comparison to the stock blocks. The material can be cut with a knife or bandsaw and the holes bored with sharpened brass tubing in a drill. ok ive looked at mcmaster. the polyurethane must be stronger than the isolaters that dave brown sells. the second set of isolaters is shot. that rubber simply disintegrated in less than a year. not durable whatsoever. would you call to order the sample pack from mcmaster? I'm stuck because this airplane is set up for that engine mount , so I would like to use it , if possible. I bought 2 sets of replacement blocks last year. They felt gooey sticky and soft. As if I could easily rip them apart. I installed them with a new engine in a used Viper 120 and the plane sat all winter. Never run. This weekend I took the plane out to break in the engine and noticed the rubber was cracked? I started the plane and the engine nearly fell out. All four blocks had failed. The only thing holding the engine was the nose ring. I took the rubber out in pieces and installed the second gooey set. Try it again next week. i would not use them . mine were the same as well. still trying to find a substitute for that crap. There are several options on the above website. You will have to cut to fit, but the price is quite reasonable for a sheet and you can cut a lot of replacements. Pancake is right - just throw out all the gooey mounts. They are junk (been there and tried that - once). You may want to look at the polyurethane sheets. Hardness starts at 45 A scale to 95 A scale plus they show 75 shore hardness D scale with a tensile of 8 ksi. The 75D is the stiffest most likely. All of this material has much higher strength than all other rubber stocks. It's not cheap for a 6x6" piece but neither is the plane. can someone post which sheet they bought from them and had success with. i am sure i would buy the wrong one. otherwise i,m removing that mount and tossing it. What a PIA. Just seen this thread. Same problem here in the UK. Now retired and trying to resurrect my old YS 140 pattern ship from 1998. I have just emailed McMaster to see whether they can offer any guidance. Just heard from McMaster. They cannot export outside USA unless it is to existing suppliers. I used some Viton material that worked great. Have enough to last me. Send me a Private message and I will consider cutting some off and send for postage only? I'm trying to resurrect a Typhoon 2000 I built years ago on which I unfortunately chose to use this mount and, of course, the rubber blocks are mush. I purchased some material recommended above from McMaster Carr. Can someone please explain how to remove the isolator mounts from the flat beams; the ones that are held on with locknuts? Using a nut driver, the whole isolator mount spins. The nuts seem to be inserted into T nuts that are flush with the bottom of the beam and I see no way to stop them from spinning. My mount have a taper head bolt and this has a recess for an Allen key/Hex wrench to hold it while I use a normal spanner on the lock nuts. Warning - be careful not to put too much pressure on the spanner otherwise there is a risk of stripping the hex recess. I have now sourced new isolators from Ohio Super products. Still not sure whether they are up to the job since I have gone through 3 sets in trying to set up my YS 140 FZ. This engine vibrates an awful lot - not sure yet whether it is not properly set up yet. It is OK at mid range and top end but I cannot get smooth running at 2,000 - 2,400 rpm yet. eddiech: Thank you so much! Those little holes in the taper head bolts were so filled with crud I didn't realize what they are. The material I'm trying from McMaster Carr is item #1460N16, High temperature silicone rubber sheet, 1/4" thick, 70A. I bought a 6" square sheet. I'll report on how it works out. I hope in the next week or so. Nice to know where parts for the mount can be bought. After reading the above posts, I decided to make my own rubber blocks from this material. I flew my Typhoon with a Webra 1.40 for at least two, perhaps three, seasons in pattern competition and never changed the blocks after many hundreds of flights. They seemed to hold up fine. The plane has been sitting unused for about five or six years and the blocks were completely disintegrated. If this does not work out, I will probably bite the bullet and mount an OS 1.60 two stroke which I have along with a Hyde mount, header and tuned pipe that was going into another plane I've since decided not to build. It will be a big project and require major surgery to do that. I may even have to make a new cowl. 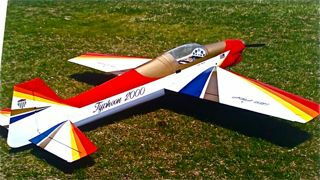 For me, it will be worth the effort since I built this plane using wood, including the wing. I also think it the best looking pattern design ever. Last edited by bokuda; 08-20-2018 at 03:32 PM. I'm posting this in case there is one other person in the universe who might have to make this repair. 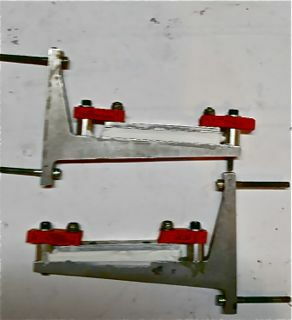 The first photo shows one mount with new, replaced isolator blocks along with the other, disassembled, un-repaired mount. I used, a 1/4" nut driver and a small (1/16th I think) hex wrench, to remove the inner isolator posts. They are held to the "floating" bar by tapered head machine screws with recessed hex openings, topped with lock nuts. Weird. I've never seen those machine screws before. Also shown is a disintegrated original block. The parts are covered with gooey, melted crud from the blocks. That goo is easily removed with acetone. 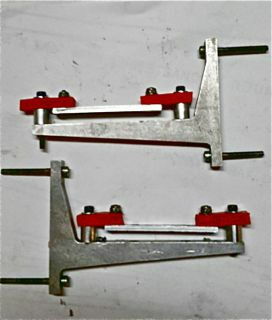 The second photo shows the "almost" completed mounts. I intend to put exterior grade silicone caulk between the isolator rails and the actual engine mounts. The new blocks, even though stiffer that the originals, are quite flexible and the flexible caulk will supply some cushioning. 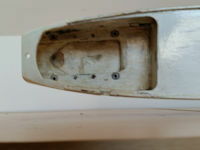 Residue from caulk can be seen on the upper, disassembled mount. Also in that photo is the red, silicone material from McMaster Carr that I used to make the blocks. That material is very easily cut with an exacto blade and the holes made with a sharpened brass tube chucked in a drill. Back when I was building this plane someone warned me I would regret using this mount, but I cheaped out and used it anyway, not wanting to part with $200 for a Hyde mount. I DO regret it! Let us all know how it works out in practice. Which engine you will be using and how do the isolators stand up to the vibration. If they are pretty rigid how does the model cope? I have found that the isolators from Ohio Super Products do not like the vibration of my YS 140 FZ. You might need to experiment a little. I used replacement rubber with a durometer rating of 60 for my mounts, but I was only running a YS 1.10. Hyde mounts are, by far, the best way to go! Central Hobbies seems to be selling out their stock of Hyde mounts, not surprising since pattern is almost exclusively electric now. I think you can find Merle Hyde's email address there and he can probably still provide a new mount to meet your needs. gine running in the next few days. flywilly: I have no idea what durometer rataings are or what they mean, but the material I bought has rating of 70. At $20+ per 6" square sheet with shipping, I won't be doing much experimenting with it. If this fix doesn't work, I'll install, with a lot of work, the OS 1.60 with "all the fixin's" that I already have. Last edited by bokuda; 08-23-2018 at 05:18 PM. They should be banned! I woudn't recommend it to anyone. Put the money toward a Hyde mount and spare the grief. Merle Hydes contact information (email and phone) are still listed on Central's web site; so, hopefully if you need a specific mount you can still get it direct from the manufacturer. I will continue to hoard my remaining stock of his excellent engine mounts - I have yet to wear one out and I started using them almost 30 years ago! I agree with everything that has been said in this thread. However, the model that I am trying to resurrect from 1998 does not have a firewall for attaching a firewall mount. It has a thick plywood beam mount built in. The Vibradamp mount is attached to that and consists of only the beam bits, not the T bits. I am stuck with trying to get the Vibradamp mount to work properly OR I just ditch the model and go electric with a new model. So far I have been through three sets of isolators from Ohio Super products and the YS 140 FZ is still being set up. eddiech: It would be shame to ditch the model. You might try adding beams the thickness of the mount on top of the current beams and run the YS without a soft mount. I would first drill out the holes in the current beams and fill with dowels. Someone said the OS 1.40rx is a drop in replacement for the YS 1.40. I have not yet been able to confirm that. That would allow you to do the same with a two stroke engine with less vibration. I will not get a chance to run my repaired mount/engine combo until at least tomorrow or early next week.